In this study, we have prepared a novel polymeric drug delivery system comprised of ionically fixed polymeric nanoparticles (IFPN) and investigated their potential as a drug carrier for the passive targeting of water-insoluble anticancer drugs. For this purpose, the physicochemical characteristics of the IFPN were investigated by comparing them with conventional polymeric micelles. 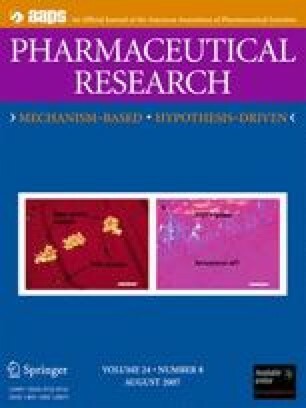 IFPN containing paclitaxel were prepared and evaluated for in vitro stability and in vivo pharmacokinetics. The IFPN were successfully fabricated using a monomethoxypolyethylene glycol-polylactide (mPEG-PLA) diblock copolymer and a sodium salt of d,l-poly(lactic acid) (d,l-PLACOONa) upon the addition of CaCl2. The transmittance of the IFPN solution was much lower than that of a polymeric micelle solution at the same polymer concentration implicating an increase in the number of appreciable particles. The particle size of the IFPN was approximately 20∼30 nm which is in the range of particle sizes that facilitate sterile filtration using a membrane filter. The IFPN also have a regular spherical shape with a narrow size distribution. The zeta potential of the IFPN was almost neutral, similar to that of the polymeric micelles. In contrast, mixed micelles with a combination of mPEG-PLA and d,l-PLACOONa prior to the addition of Ca2+ showed a negative charge (−17 mV), possibly due to the carboxyl anion of polylactic acid exposed on the surface of the micelles. The IFPN formulation was highly kinetically stable in aqueous medium compared to the polymeric micelle formulation. The molecular weight of d,l-PLACOONa in the IFPN and the mPEG-PLA/d,l-PLACOONa molar ratio had a great influence upon the kinetic stability of the IFPN. Pharmacokinetic studies showed that the area under the concentration vs time curve (AUC) of IFPN in blood was statistically higher (about two times) when compared with that of Cremophor EL-based formulation (Taxol® equivalent) or polymeric micelle formulation. The results suggests that the IFPN were retained in the circulation long enough to play a significant role as a drug carrier in the bloodstream, possibly resulting in improved therapeutic efficiency. Therefore, the IFPN are expected to be a promising novel polymeric nanoparticulate system for passive tumor targeting of water-insoluble anticancer drugs including paclitaxel. We would like to thank Dr. Chad Brown of Samyang Research Corporation for his valuable comments. This study was supported by a grant of the Korea Health 21 R&D Project, Ministry of Health & Welfare, Republic of Korea (A040020).